German police and security officials faced criticism Tuesday following violence during a far-right protest in the eastern city of Chemnitz that left at least 20 people injured. Police said in a statement that two police officers, nine far-right protesters and nine left-wing counter protesters were injured in the clashes. 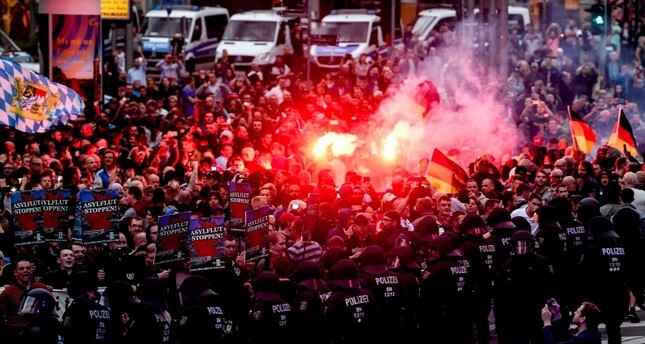 The protest late Monday, sparked by the killing of a 35-year-old German man in an altercation with migrants over the weekend, erupted into clashes between neo-Nazis and left-wing counter-protesters. The German news agency dpa reported that Chemnitz police acknowledged having mobilized too few officers for the demonstration. Footage showed officers struggling to prevent far-right protesters breaking through police lines. The protesters also performed Nazi salutes and chanted "the national resistance is marching here!" The eastern state of Saxony, where Chemnitz is located, has long been a hotbed of anti-migrant sentiment. The far-right Alternative for Germany party received almost a quarter of the vote in Chemnitz last year. The opposition Green party accused Germany's interior minister, Horst Seehofer, of fanning anti-migrant sentiment in recent months and urged him to think about resigning in the wake of the violence. Green lawmaker Konstantin von Notz told the news portal t-online.de that the violence in Chemnitz recalled events in other parts of eastern Germany during the early 1990s, when authorities failed to stop far-right mobs from attacking migrants. Chemnitz police said they have arrested a 22-year-old Syrian and a 21-year-old Iraqi on suspicion of manslaughter in the death of the German man after a street festival early Sunday. Prosecutor Christine Muecke said the killing was preceded by a verbal confrontation that escalated.